but an awed stillness rather, and breath-holding, as if it were the passing of the dead! Joshua Lawrence Chamberlain Christian, Professor, General, and Governor of his home state of Maine. Chamberlain came from a line of warriors. Great grandfathers served in the Revolution. a grandfather in the War of 1812, and his own father in Aroostook Indian War. One brother served with him in the 20th Maine and another as a chaplain of a Maine Regiment. Chamberlain was raised as a Puritan and Huguenot. He attended a Military Academy as his father, a Lt. Col. of the Militia, wished for him to enter West Point. His mother desired he enter the ministry, which he chose to pursue for missionary work. Chamberlain taught himself Greek as a youth in order to enter Bowdoin College (he would eventually master nine languages). After graduating from Bowdoin, he attended Seminary for three years and graduated with a Master's Degree. 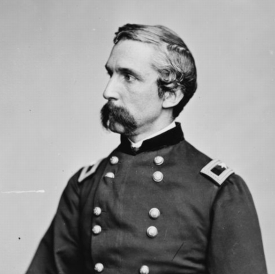 He returned to Bowdoin as Professor of Rhetoric on the faculty until he entered the service of Maine as the Executive Officer of the 20th Maine Infantry Regiment. While at Bowdoin, he befriended Harriet Beecher Stowe, who wrote the little book, "Uncle Tom's Cabin". Stowe’s whose brother, Henry Ward Beecher, was leading theologian and abolitionist of the era. Stowe's book and Beecher's theology transformed society's understanding of the institution of slavery in America, and certainly convinced Chamberlain that slavery should come to an end. Chamberlain's first major battle was at Fredricksburg, where he was pinned down all night by the withering fire from the stone-wall at Marye's Heights. It was at Gettysburg, however, that Chamberlain distinguished himself as the commander of the 20th Maine, which held Little Round Top on the flank until nearly out of ammunition, and then he ordered a tricky maneuver with a bayonet assault down and across the flank of the advancing Confederate forces anchored on one of his companies, like the swinging open of a gate. Another of his companies that had been cutoff early on, happened to be in just the right position to block the Confederates as they retreated. Chamberlain distinguished himself again at the Siege of Petersburg, where he fell, thought dead his obituary appeared the next day. General Grant promoted him to General on the battlefield meritoriously. Chamberlain was a recipient of the Congressional Medal of Honor. He fought in 20 battles. He was wounded six times and had six horses shot from under him. He was cited for bravery four times. After the war, Chamberlain was elected for four one-year terms as Governor. He then returned to teaching and served as President of Bowdoin until his old wounds forced him to retire. In 1898, at age 70, he volunteered for the Spanish American War but was turned down. His war wounds continued to plague him until his death in 1914.